Local Boards of Health were formed across England and Wales in response to cholera epidemics and were given powers to control sewers, clean the streets, regulate environmental health risks and ensure the proper supply of water to their districts. But as Batley grew, the Local Board of Health did not have the necessary powers needed to develop the town. The board was merged with Batley Council shortly after it was created. The pressures of rapid population growth, industrialisation and urbanisation meant that Batley needed to dramatically improve its infrastructures such as water supply, transport routes and housing. The industrial revolution and Batley’s Shoddy and Mungo mills had given a rapid growth to the population. Batley also needed to develop new public services such as education, health, town planning and architecture, gas and electricity supply. 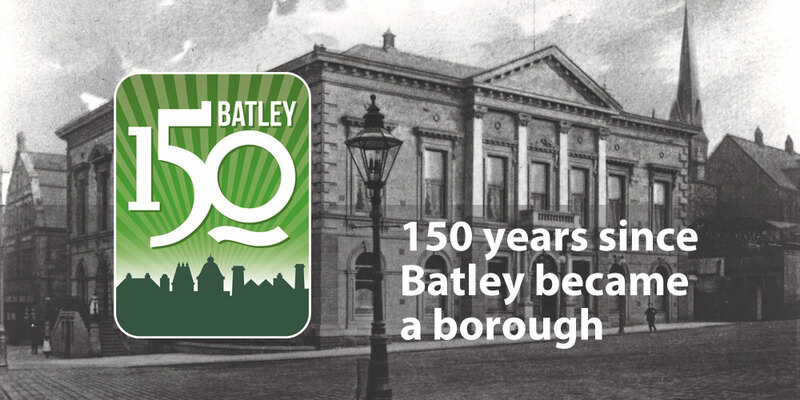 Becoming a municipal borough meant that Batley would be given the power to create a council that could raise funds and develop these services for the benefit of the town and its citizens. 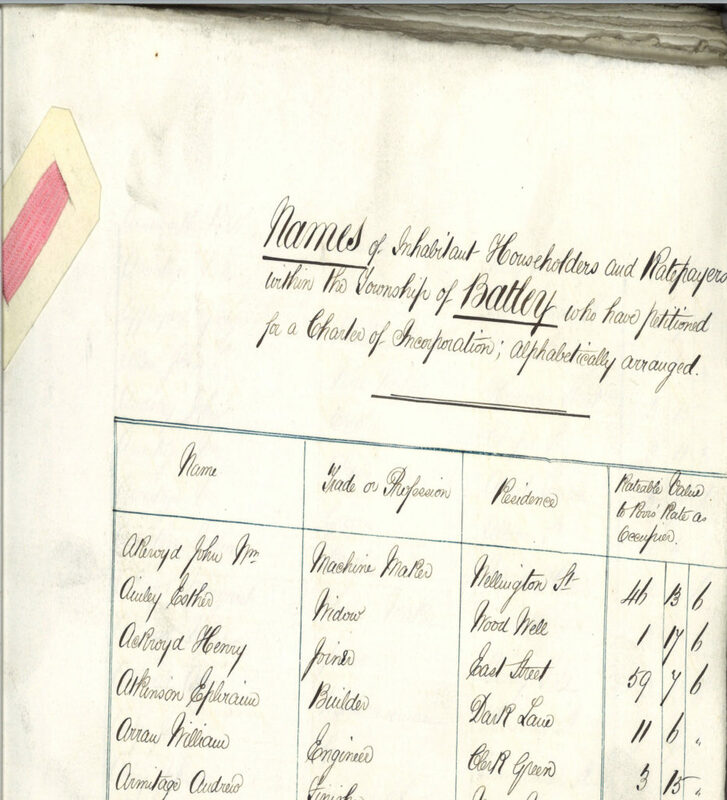 Batley’s Local Board of Health created a Corporation Committee to manage the process of becoming a borough. Becoming a borough would mean greater legislative power and equality with Dewsbury. 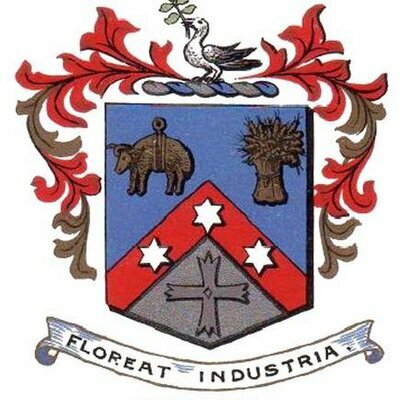 Dewsbury was incorporated in 1862 and many people in Batley were concerned that if Batley didn’t achieve borough status on its own then Dewsbury’s boundaries would be extended to include Batley. This was a justified concern as there were several attempts to extend Dewsbury’s boundaries to include Batley. In 1867 Dewsbury intended to present a Bill for taking Batley and other surrounding areas into its boundaries. The Bill was abandoned but the threat lingered. In July 1867 the Chairman of the Local Board of Health called a public meeting to consider applying for a Charter of Incorporation. In September 1867 a petition was taken to Householders and Ratepayers to sign. The petition was then submitted and the government’s Privy Council appointed commissioners to undertake an inquiry. The commissioners heard the arguments in favour and against in the ‘Public Hall’ (Batley Town Hall). The petition: photo by West Yorkshire Archive Service. There were those for and those against a Batley borough. The objectors Included Batley’s outlying areas and of course the Dewsbury Corporation. Some thought the incorporation of a borough would be costly whilst Dewsbury again argued that one authority should control the whole valley. The commissioners reported back to the Privy Council who decided Batley should become a borough and they made the arrangements for Queen Victoria to issue the Royal Charter of Incorporation. The Royal Charter received a great pomp and show at the railway station and paraded through the town amid a noisy and colourful celebration. Elections were held on 13th January 1869 and the first council meeting took place on Thursday 25th March 1869 at noon at the Public Hall with 18 councillors from the three wards in attendance. During the first meeting, councillors made their declarations, voted and appointed the 6 Aldermen of the Borough and appointed John Jubb (one of the councillors and alderman) as the first Mayor of Batley. They also appointed the Town Clerk, Treasurer, the Watch Committee (responsible for basic policing), appointed new members to the Local Board of Health Committee, appointed the Finance Committee and several other posts including those responsible for the collection of rates.